You have some beautiful scraps, if those first four blue blocks are anything to go by! I have a bunch of ways I sort scraps. One thing I do if I have at least a 2.75" X WOF "scrap" I trim it to 2.5" and sort those into coordinating self-made "jelly rolls." I have used those jelly rolls in scarp quilts and it is so much fun. I also don't put tiny scraps into baggies by color - I trim them down to a usable size (I bought the Cut the Scraps and use her system for my small pieces). I've got quite a few of the 5" ones and was thinking the other day I should sort them into coordinated bundles and make little charms packs out of them. I also have a big plastic bin with larger scraps sorted by color...and lastly I have a basket next to my sewing machine where I toss recent scraps...when that gets overfilled, I dump them out and sort and organize them, but I do find that I will pull something out of the basket when I am working on a smallish project. This post is hilarious, Leanne. I like to think that all quilters suffer from 'too many scraps' unless they are the type who discards all pieces smaller than a fq! and I do know some of those. My description of a scrap is anything that I don't love anymore. Might be 3m but it's not likely to get used in anything I make now. I am on a mission to reduce my stash to make room for some of the yummy new fabrics out there! Good luck with your quest! Linda Schmidt. I have the same problem you have, Leanne! Our town has a lot of traditional quilters who love Bonnie Hunter and exposed me to her scrap system. She has a couple books out called "Leaders and Enders" that use scraps (it's more than that, but we're talking about scraps). She recommends when you have leftover fabric from a project smaller than a specific size (that you fold and put back in your stash), that you immediately cut and put into a scrap box. She does recommend clear boxes and I think she has recommended sizes to cut. I recently took a few of my scrap boxes, ironed them!, and started cutting. I've got squares and strips in different sizes. I've also cut hexagons in different sizes and started a box for flying geese squares. My strip box has strips up to 2.5" strips. Anything smaller than 1.5" but larger than 3/4" I put in a separate stack. All of these are in clear boxes and arranged by size. 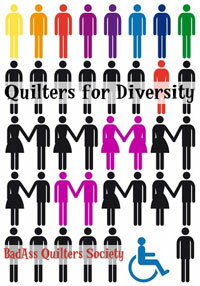 I've seen some who organize by color that look great. Whatever works for you. I can definitely see this working well for a scrap project, and definitely for the strip blocks you mention. If you find a system you love, be sure to share it. Organizing a sewing room is a crazy task! I want to hear more about the use of tiny scraps as stuffing. I've always thrown away anything to small to use, but I've wondered more than once if there wasn't something I could do with them. I thought they'd be too hard when packed into a throw pillow for the couch - what do you stuff with them? A scrap can't be a fat quarter...otherwise my entire stash is scraps!! I think they are much smaller than that. I love that last block - so so beautiful. I really love scrappy projects - I think they are my favourites as they are always unique. I define a scrap as the cut up fabric left over from another project. It has to be smaller than a fat quarter for me to consider it a scrap. I think organizing by color is the best, but as I don't have it that way, I guess I can't really say. Mine is a hodge podge right now that doesn't make much sense and is all over the place disorganized. I often think of doing the method where you cut your scraps into 5", 3.5", 2.5" and long strips. But it is so much work starting with my scrap pile and I don't really like just cutting for hours and hours. This is a never ending project for me. I have been trying to sew from stash for the last couple of years. I did use Bonnie Hunters system and some of it works really well for me I went through my stash and those fabrics I didn't love I cut it up and I add to the system as I sew from stash as well. I use the 2.5 in strips the most along with 2.5 in squares. I also have 1.5, 2, and 3.5. I haven't used many of the others. I also have strings separated by lights and darks. 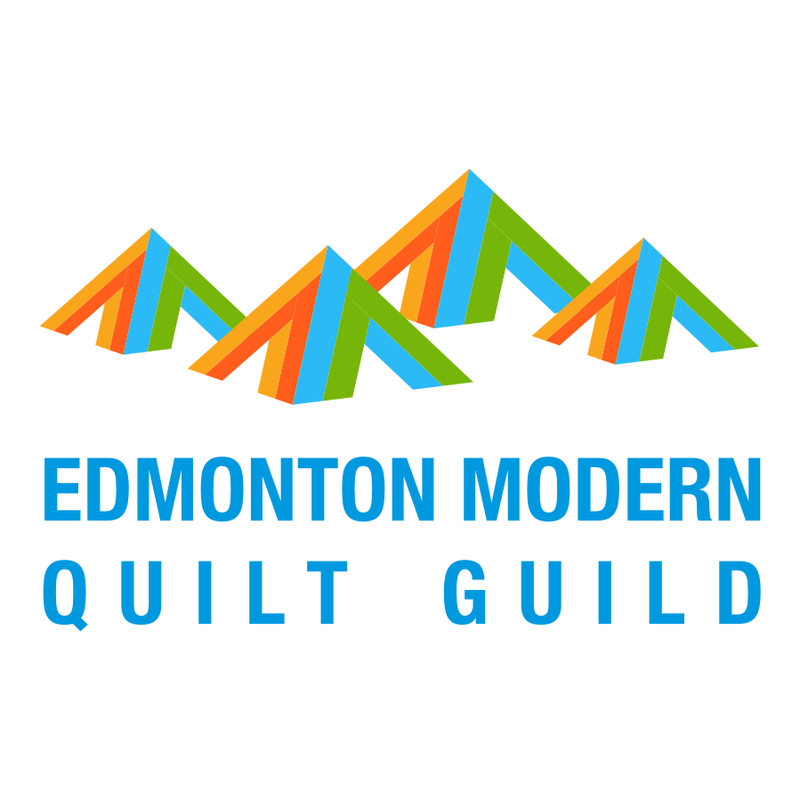 I am making a light string quilt. I think cutting 5" squares would be handy too. I do save weird sizes that I don't want to size down my color group. I am not a huge improve sewer so not sure I am going to use them. I do love scrap quilts and the more scraps the better they look. I do like them coordinated but sometimes I just can't manage that. I have realized I will never be able to sew through them all and need to also do some serious purging as well. I am excited to see what you find that works as well. Great post and will look forward to Tuesdays. Most of my stash would be classified as scraps if we're counting anything under a fat quarter. I don't have any suggestions for storage, except the same questions as you! I like Nicky's idea of just cutting for the current project(s). I think I might use one of my vacation days to plan a scraptastic project!!! It's a brilliant idea! I'm looking forward to your posts on this! 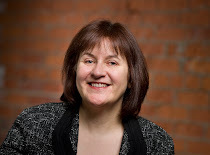 Have you seen this blog post by Lori Holt? http://beeinmybonnetco.blogspot.com/2013/08/from-my-quilty-studiohow-i-save-my.html She cuts her scraps after they are generated into defined strip sizes i.e. 1.5", 2.5", 3.5" and sorts them by size. I've been thinking of using all my scraps to create a unicolored scrap panel in order to make fabric baskets. I must admit I save even the smallest scraps .5" to use for tiny hexies. I think definitions of what a scrap is are individually relative. Mine are quite small, anything less than 6-8" square probably but then that's because my stash is mostly fqs. This year I emptied my scrap bins and sorted as much as I could making the strip rolls for my rag rug and cutting lots of sizes of strips and squares from them. Now they are neatly organised but still unused. Perhaps in a month or two (when I've culled some of my current projects ) I will join you and Nicky in using them up. Thanks for the link to the choose your own block along. I started the Tula Pink blocks a short while ago, and maybe this would encourge me to keep going. I do use the Bonnie Hunter system for scraps - but if you do only make the size of cut scraps you will need. As a friend knows I use scraps, she was at a retreat and brought all the ladies from there 'scraps' to me..... Some of these 'scraps' were big pieces, not what I would consider a 'scrap'. So, because I would rather sew then constantly cut, I went and bought myself a GO system, not something I had ever even considered before but I can either cut or sew and I want to play. I love your block you show above. This alone will use up a whole lot of your scraps. For me right now, I am making a Bonnie Hunter pattern called "Fair & Square" and it uses up a whole lot of strings, 1.5" squares and 2" squares - it is a lot of sewing, but if I have the fabric, why not use it?? I will be learning as you take this journey. Thanks for letting me come along for the ride!!! Oh the magic you will be creating from your stash!!! I've been working on using up scraps for months and still have a mountain of them. Of course, I save all but the smallest bits. I'll be following/joining you! Your comment about not wanting to cut individual pieces sounded like something I have said. I find if I use the scraps for paper piecing I don't have to cut them so much. Sometimes I don't even iron them until they are on the paper! Being afraid that I'll end up with fabric cut into a size that doesn't work for me is precisely the reason I can't subscribe to those scrap management systems that have you cut stuff up right away. 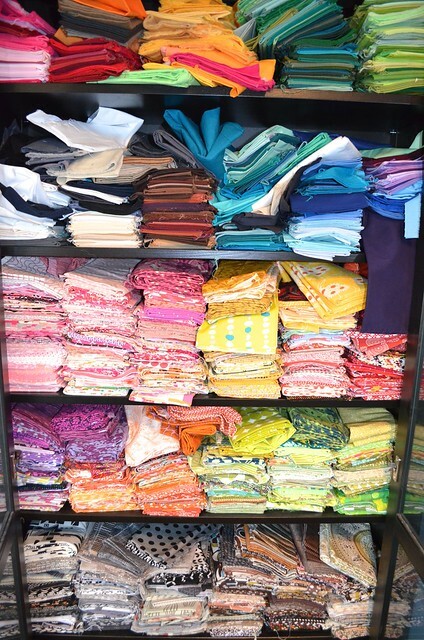 I sort my scraps (for me, that is anything smaller than a FQ or quarter-metre WOF) by colour in my colour coded bins (made with scraps by the way). I do try to keep the strings/strips < about 3" wide separated from the other pieces but they all live together in the bin. I make myself go to my scraps whenever I'm making random blocks (say for a guild block lottery) or other projects that require small amounts of fabric (guild round robin). But when I start a new project, I don't tend to look in my scrap bins unless it's specifically a scrap project if that makes sense. Just wanted to add that it looks like Your blended scraps quilt will be just as beautiful as the last one. 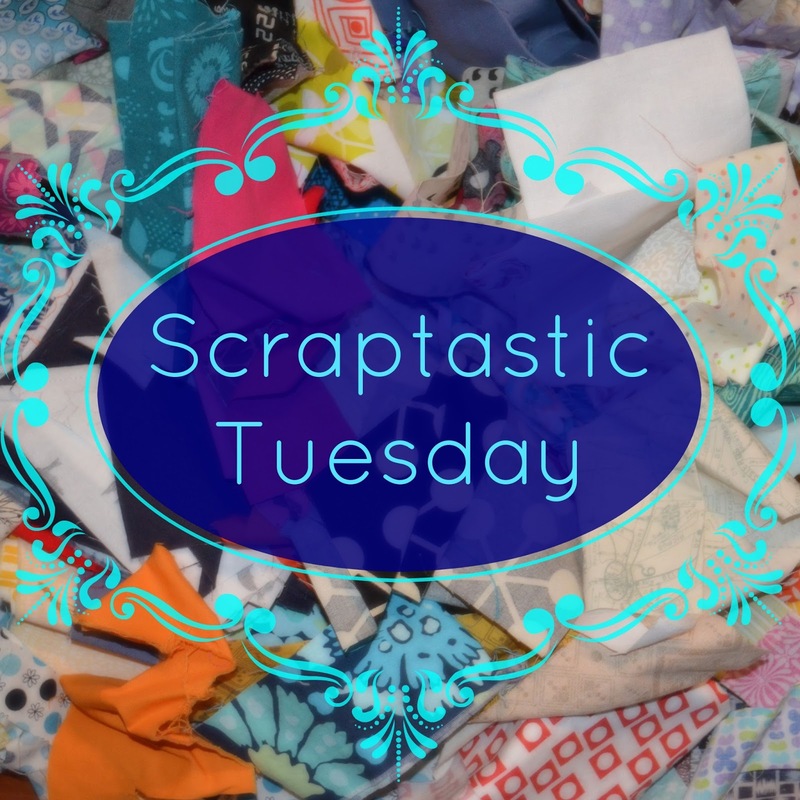 Love the idea of Scraptastic Tuesday! :) Scraps to me are smaller than a FQ. Like you my stash is mostly FQ;s. When I am cutting fabric for a project and there is less than 4 inches left I cut it right away into strips...or squares if that is all I have. Which size depends on my mood. :) I sort these scraps by the strip/square size. I use them in many different ways. I will sew them as headers and enders for some project I've decided on. Like once I made 3 inch nine patch blocks till there were enough (hundreds!) for a quilt. I also use scraps for small projects like zippered pouches and bags. I will go to my scrap drawers first. Right now I am also making Tula Pinks City sampler blocks with scraps and grays from my stash for backgrounds. oh goodness! I need to come back and read all the comments! My scraps are not organized - all tossed in a big basket. That does not really work for me either, but I definitely do not want to sort them. And fat-quarters are not scraps in my book - that's half my stash! I am currently cutting smallish scraps into 2 1/2" squares rather than toss them in the basket, with another 'postage stamp' type quilt in the plans. Anyway, I'll be interested in all the goings on here RE: scraps and will certainly attempt to join in! I find a sturdy laundry bin a good way to store my scraps, can dive in and rummage about , and because its deep, bits do not spill out whilst I am rummaging. It has a small footprint, good in my tiny flat, and is a rugged material with a strong plastic supporting ring at the top.I am making double wedding ring curves with 2.5 x 3.5 inch scrap pieces. I cut up a few scraps into these bits each night an add to the bag of potential pieces to pick from. I have been sorting my scraps by size of squares and strips. I find it helpful to take a drawer or clear shoebox of squares and place it by my machine to use as leaders and enders when sewing my project together. That way I have squares and HST ready for a quick scrap quilt. This just the motivation I need to get back to organizing my scraps. I started last year by sorting by color and then cutting using Joan Ford's method from Cut the Scraps. I still haven't made anything with them, but they sure do take up less space after they are organized! I plan to make a scrappy X and + quilt. My friend cuts up her fabrics - and separates them by size - various size strips and squares, with about a 7" square being the largest square, unless it is a "background" piece and then it can be bigger. Of course she makes lots of applique kits for students and these sizes work out well. I have my fabrics folded like you do, but try to keep the folded edge toward the front so I can slide my hand in just above the piece I want, lift the entire stack and grab just what I need. And you are right - those big tubs are practically worthless. I would find a friend with a Go Cutter and run all those little scraps through there for some tumbler quilts or something. I used "Scrap Therapy" by Joan Ford. It took me a quite a while, but I truly use my scraps now! i highly recommend you check it out. Oh - and Joan doesnt really include strings in her system, so I have a bin for those too! Great idea ladies. I need to play along as well :) No advices from my side though. I'm a bit messy when it comes to scraps. how much beautiful fabric you have there re my scraps I put anything less than a fat quarter in my collection, slowly building up the scraps as I do like scrappy quilts! As someone new to quilting I did not think I'd find myself with this issue so soon. I can just imagine how many scraps you must have. LARGE BINS..LOTS OF BINS, you have a color system which is the way I've started. I have kept all of my solids together and then made bins for the colored prints. The only baggies I use are those for the very small scraps less than 4". Once I've decided what I'm making and what color scheme it's going to be I first go my new main print and then right to my scrap heap to see what can be used. The only way out of a scrap heap is to use the scraps first and keep the heap down as much as possible. Sure hope this is of some help although I don't know how much help a "newbee" can be. 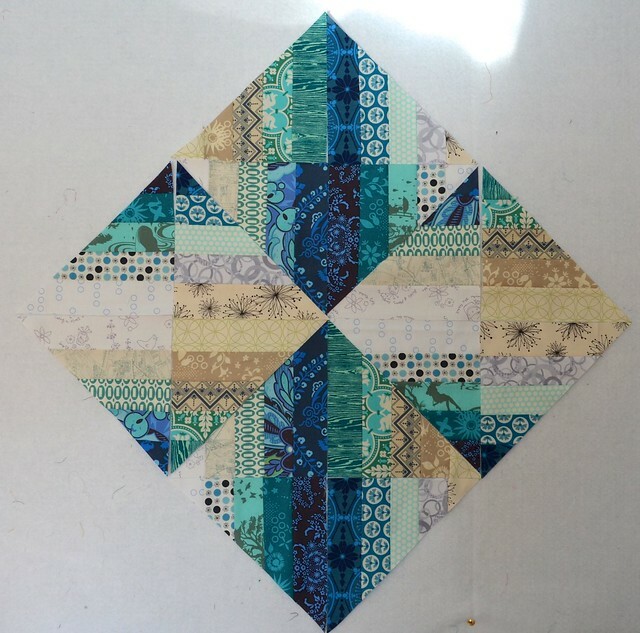 If you are afraid of pre-cutting your scraps because you are afraid you won't use that size - what about cutting them into 2 1/2" squares or strips where possible? Quilters always need that size of square or strip. You can start with that and maybe charms - there are tonnes of tutorials and patterns that use just charm squares. That way, you can have some pre-cut that you can store by size and/or colour & then you can still have uncut scraps stored just by colour that are not pre-cut. Also, if bins don't work for you (they wouldn't work for me either - too much lifting of bins on top & opening lids) what about drawers? Like those plastic stacked drawers - and they usually have wheels or are light enough to carry. If you need scraps & they are in a different room then you can bring them over while you are working on that project, then bring them back again. And! and! and! (ooo...I'm getting excited here - can't you tell? lol.) you could interchange the drawers, so if you only need colours 1, 2 and 3 you could put them all in one drawer "system" before moving them to the other room! I had a brainstorm last winter and came up with something that works awesome for me and makes it easy for my nephew to find certain colours of scraps for sewing with auntie! I hear you on the scrap organization. I have a system but then it's like filing papers - I get behind and throw things in a pile for organizing later. I also have several large shopping bags overflowing. Guess I'm not much help on the suggestions but want you to know you're not alone. Glad you are joining in the Choose Your Own BlockAlong! A couple of years ago I spent weeks and weeks sorting out my scraps - they were stuffed in ziplock bags and I was sick of having to empty a bag to find what I wanted, stuff the rest back in the bag and then iron the pieces I'd picked out, all before doing any cutting or sewing! My (ironed) scraps now live in Ikea Kassett boxes (the second smallest size) with a colour swatch (from a paint colour strip) on the front to tell me which colour lives inside. I find that this system works really well for me as the boxes are easy to access and I don't have to do any ironing before I sew. I wish you luck on your scrap organising! Yep - I'll join in!!! I have lots of scraps and love to use them :) I keep my larger scraps in plastic bin drawers so I can see the colors without having to open the drawers, and I often pull from them. Strings are kept together at the front of the drawer. Crumbs are kept in glass jars - they are so pretty sitting on my bookshelf! this sounds like a wonderful idea. I need help sorting my scraps too. they are much like yours at the moment......stashed into shopping bags and boxes. i also don't like the idea of pre cutting them into sizes. my current idea is to attempt the farmers wife quilt using only scraps. i am now following your blog as i am sure the link parties will be a great incentive. Lovely scraps, sorted or not. Sew them onto foundation such as muslin or a yucky neutral fabric. And like everyone else keeping the scraps under control is a full time effort. BUT I would rather play with scraps over pristine yardage any day. Fabric, threads, batting and any fiber. You'd be surprised how fast these add up. I use less than desirable fabric about half a yard and fill. When full enough fold over the open edge a few times and sew shut. Sign your pillow and donate to a animal hospital or any other animal oriented place. These animals just love the luxurious soft pillows. I just joined Scraptastic Tuesday as I am trying to learn to use my scraps more! Wow...your scrap stash is ...well....quite a stash! I just finished organizing my scraps, stash and sewing room to get a clean start on my next project and I want it to be something scrappy! 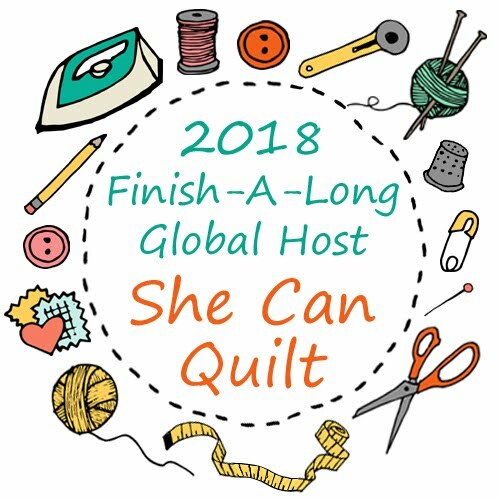 I am not a scrappy quilter as they just look (to me) messy, cluttered, to busy and oh did I mention I am an over organizer? But I was going to mention...and it might not be enough for what you have, but its a start and organized, but I have found that a tall plastic drawer bin on wheels($13) is perfect for scraps! I put colored labels on the front of each drawer for the color in there. I have 2 colors per drawer at the moment but you could get two wheelers and have one drawer for each color. It is tall and has 5 large drawers and when I need the scraps.. I just roll it next to my sewing table and open drawer as needed! Works great! I joined to follow you too so I am looking forward to tips, tricks and fun! 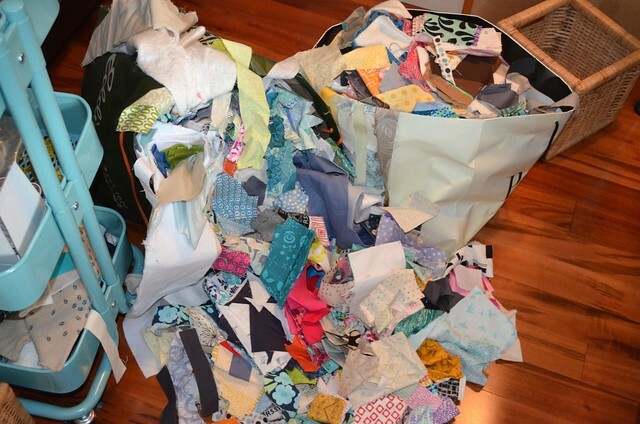 Love your scraps stash! I just have bins right now, too, for the <FQ pieces. Some day I'll get more organized with that. Can't see it happening soon, though. bleh! Almost all of my quilts are scrappy...and my scraps beget scraps, beget scraps...until I either use them up or get tired of seeing those particular scraps and move them on. I attempt to organize my scraps by color and size. I keep my strings/strips in one 3 drawer rolling bin with sections for different colors within each drawer. 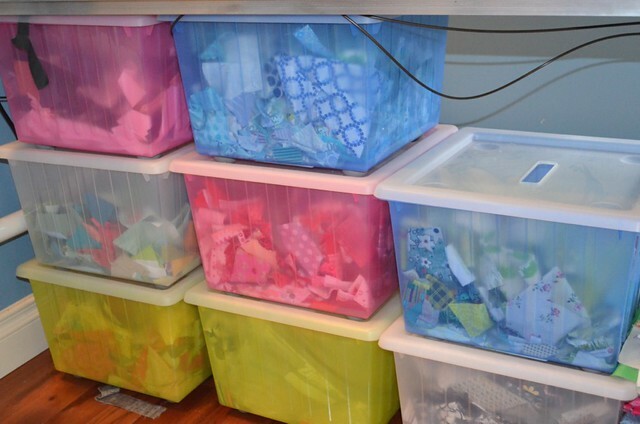 My larger scraps (smaller than a FQ) used to live together but that 3 drawer bin was overflowing so I removed all the squares and triangles, put them into baggies and gave them their own drawer.... Scraps have a way of resisting organization and my scrap management strategies are always evolving. I'm looking forward to learning and sharing tips with other scrap lovers.